So recently, I dropped into Borders’ graphic novel section and did what I always do. grab a book at random, and start reading. Well. 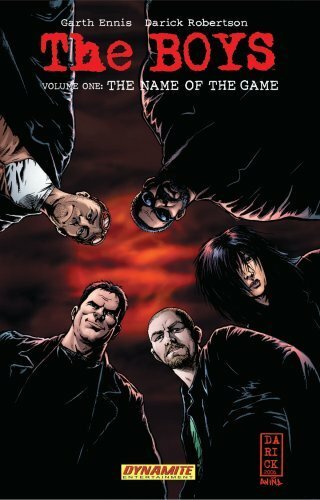 I managed to grab the first anthology of Garth Ennis’ The Boys, a graphic novel based on the premise that superheros are to negligent in there work, that they have too high a casualty rate, and now a renegade group of violent rebels is out to stop them. the comics folow both these rebels and the superheros, but larely so that we see that the rebels are justified when they smash the super’s faces in. This is one of the most violent and bloody comics I have ever seen. it also contains a massive quantity of, for lack of a better phrase, “adult content” (though they never actually show anything). All in all, I thought it was a good comic, but definately not for everybody. This entry was posted by Patrick	on Tuesday, December 23rd, 2008 at 2:12 pm and is filed under TPBs/graphic novels. You can follow any responses to this entry through the RSS 2.0 feed. You can leave a response, or trackback from your own site. I keep wanting to pick this up, after having read Ennis’s run of the Preacher and Punisher. I’ll have to recommend the library get it.